Canadian art has been historically recognized for its representations of the country’s magnificent landscapes. Near the beginning of the twentieth century, the Group of Seven set out to capture Canada’s cultural spirit by painting the transcendent force of the wilderness. Their work reflects the purity, beauty, and mystery of nature—the mythos of the untameable Canadian frontier. However, Canada is more than just a stunning backdrop; it is a country with diverse origins and complex politics. Before international immigration, and before the European settlers, First Nations peoples had inhabited the land for thousands of years. Questions of culture, identity, and place have remained important in Canadian public discourse—as well as its art. 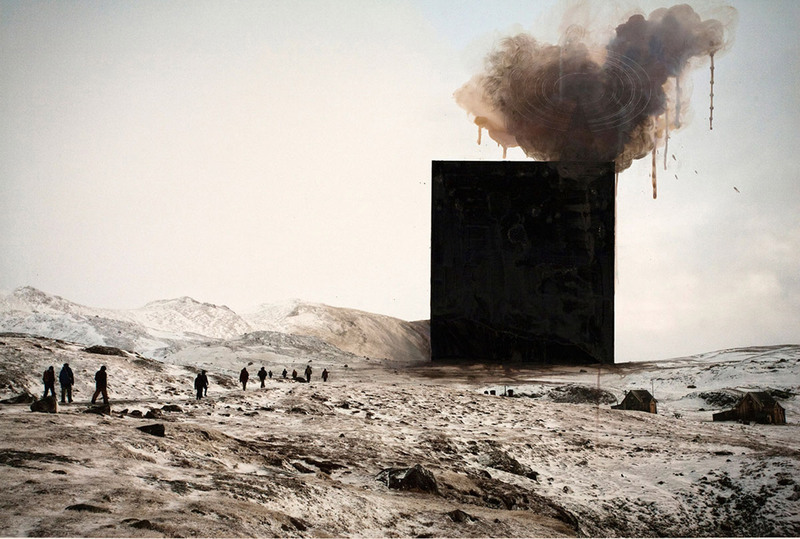 Featured here is a selection of contemporary artists who explore this multiplicity of heritage in their own ways. 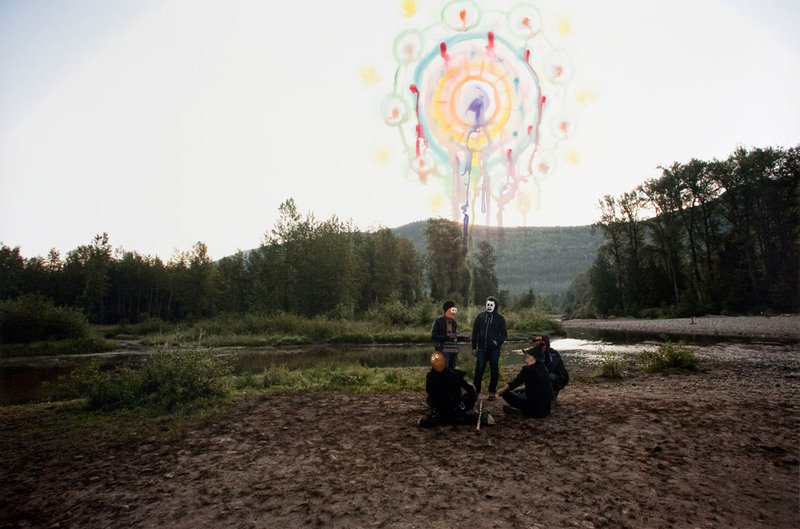 With touches of surrealism, magic, and cultural critique, they subvert traditional landscape images to tell a more modern and diverse story of Canadian history and identity. Top: Kent Monkman is an artist of Cree ancestry who critically revisits colonial landscapes by inserting First Nations and queer perspectives. The landscapes of Lunakhods are hazy and dreamlike. 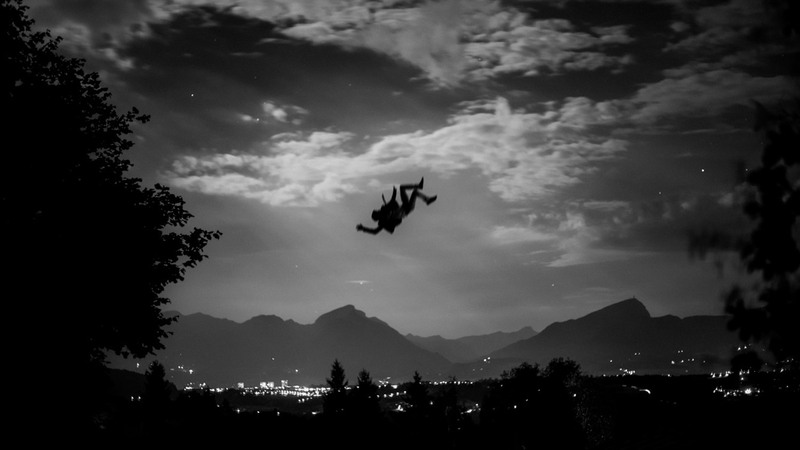 Lunakhods is a collaboration of two Toronto-based photographers. 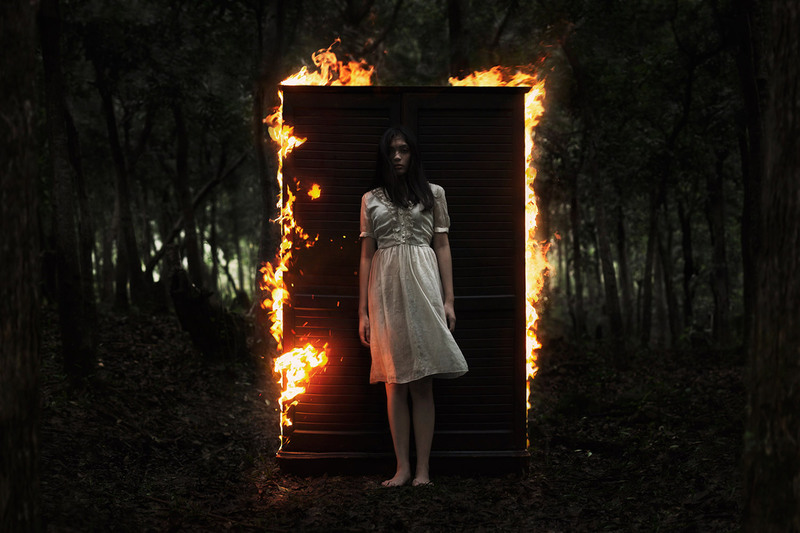 Their imagery is characterized by surreal outdoor photography. 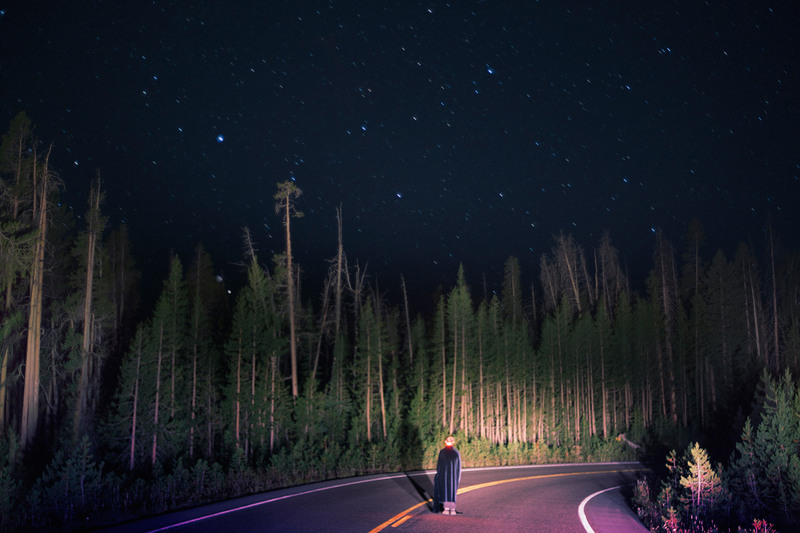 Familiar landscapes—such as rural highways, tree-lined mountains, and city parks—become unearthly, lulling and seducing the senses. While some of the landscapes are clearly from south of the border, the luminescent, candy-colored haze that blends the photos together has a way of making the boundaries of nation and time seem irrelevant. Vanderhorst gives Canadian landscapes an almost Dalí-like twist. 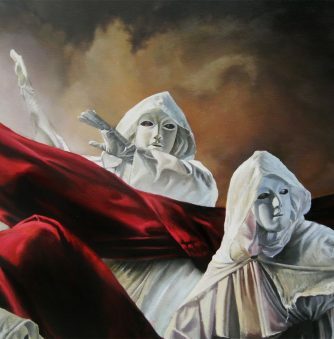 Robert Vanderhorst immigrated to Canada from Holland in 1951, bringing with him the tradition of Dutch painting and a love for modern surrealism. 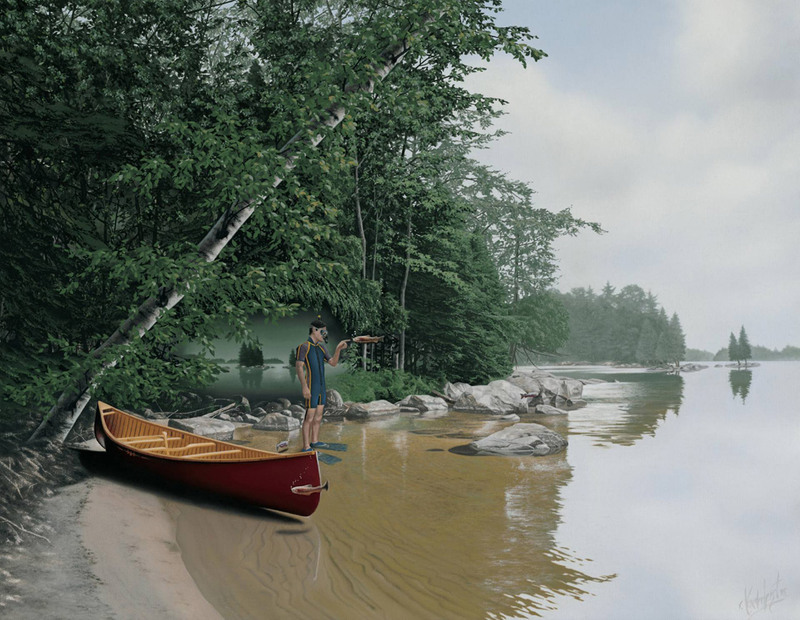 The Canadian lakes and forests that he depicts are seamlessly fused with elements of the bizarre, such as floating fish and stray astronauts. 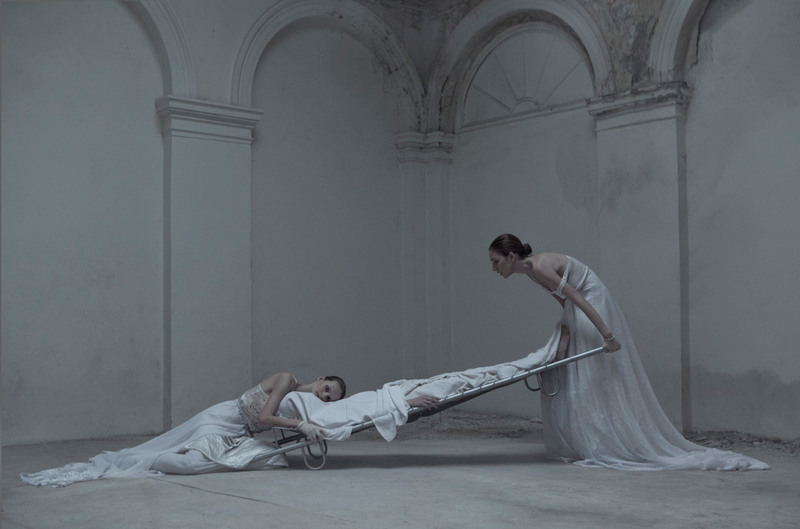 Vanderhorst’s works aim to engage the viewer by troubling them with collisions of normality and strangeness. 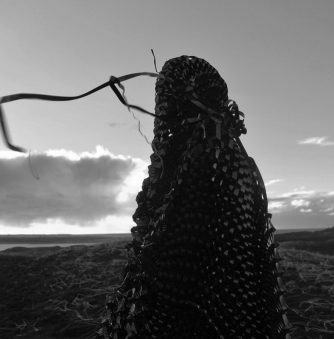 Boyle brings the metaphorical landscapes of life, death, and culture into her sculptures. 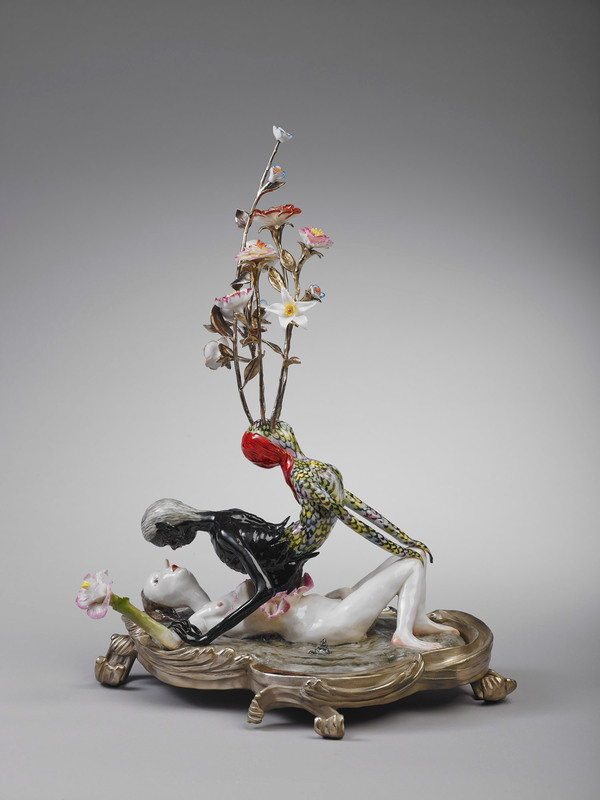 While they might look like fragile, domestic curiosities, the porcelain sculptures of multimedia artist Shary Boyle are fierce and unbridled in their representations of sexuality, violence, and colonialism. Featured here is “Maker’s Award” (top), and “Moths Drink Tears” (bottom). 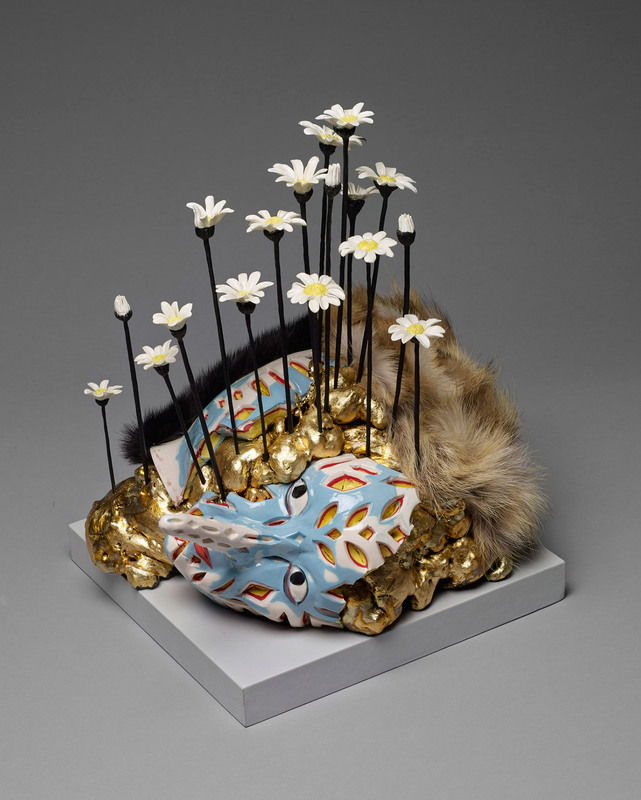 Both works abstractly show Canadian flora sprouting from symbolic hybrid bodies; human forms, animal skins, and masks blend into organic beings, representing how cultural pasts—the fusions between animate and inanimate life—are reborn into present-day landscapes. 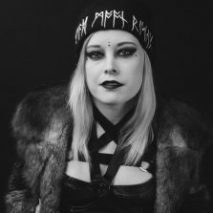 Zilberberg introduce pagan mythology, divinity, and female energy into Canadian settings. 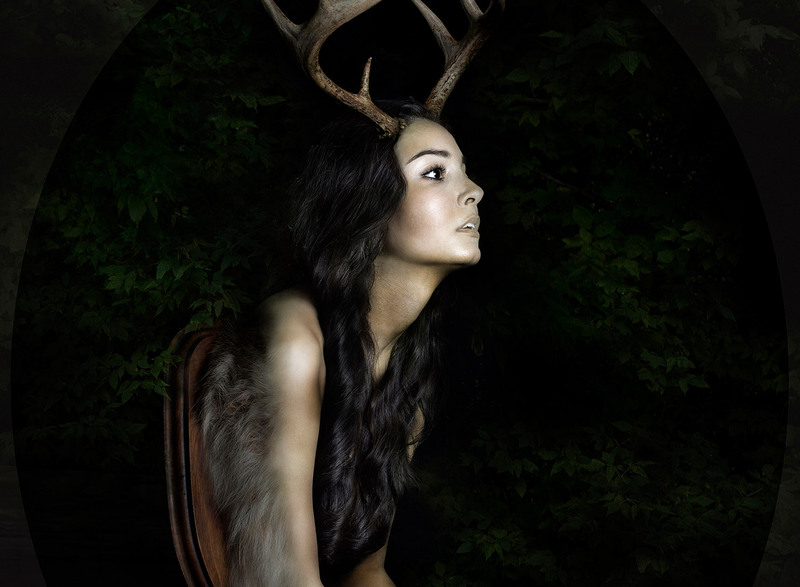 Blurring fantasy with reality, Alice Zilberberg brings figures of mythology and folklore into Canadian environments. As she is interested in the empowerment of the feminine body, many of her works depict women as horned goddesses and airy spirits. While some of her images imply sacrifice and suffering—see the mounted deity head above, for example—the forests are represented as a source of healing, identity, and strength. Born in Estonia, raised in Israel, and now living in Toronto, Zilberberg’s newer landscape works focus on wider themes of transnational identity and displacement. Johnson alters photographs by painting and etching on them in order to reveal their symbolic, emotional meanings. 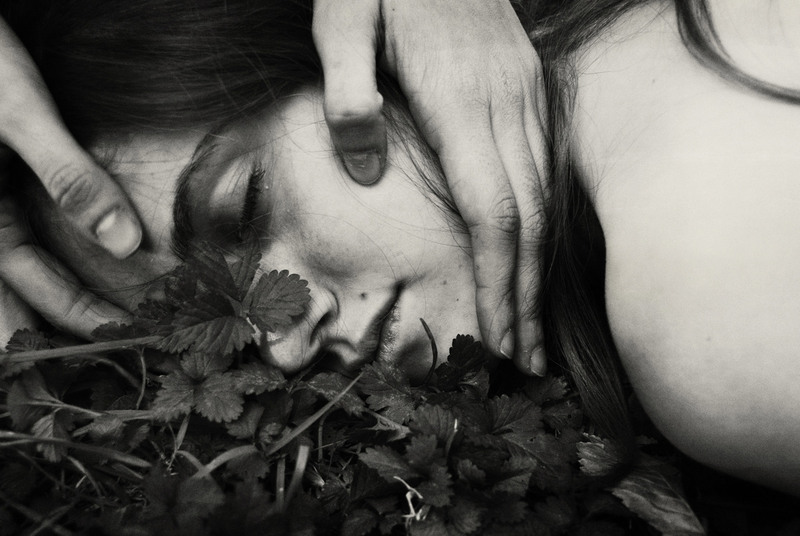 Sarah Anne Johnson is an artist from Winnipeg who is interested in the limitations of photography, and the ways in which photos can be manipulated to help uncover the emotional and bodily experiences of the portrayed moment. By painting and etching patterns and shapes onto photographs, Johnson distorts our perceptions of traditional Canadian landscapes and the people within them. 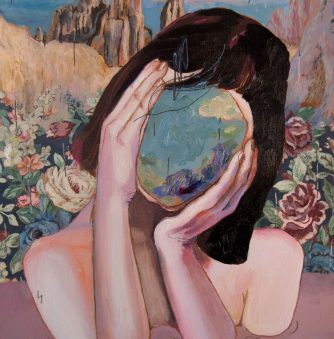 Her themes include examinations of false utopias, environmental degradation, human connection to nature, and the rejection of societal norms. 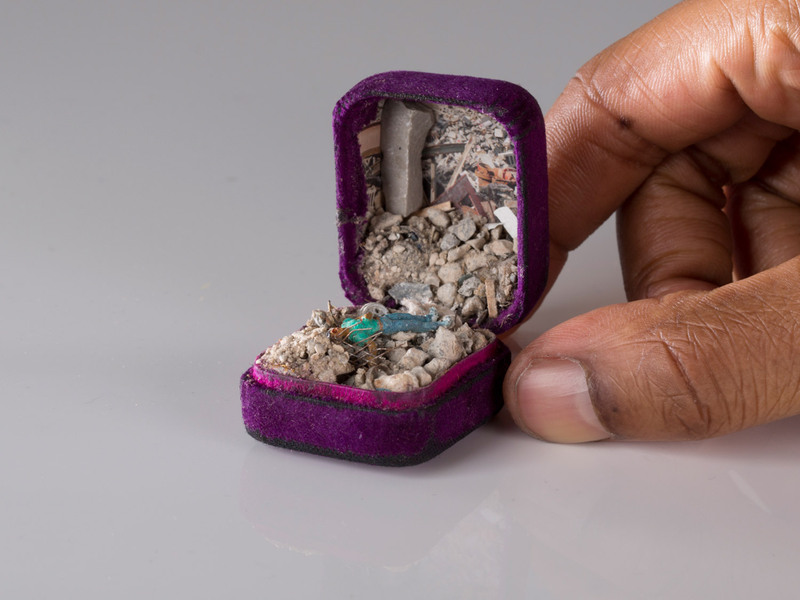 Talwst sculpts and paints tiny dioramas inside ring boxes—but the scenes are deceptively beautiful. Art history, race politics, and cultural atrocities cross over in the miniature worlds of Talwst, a Canadian-Trinidadian artist living and working in Toronto. Using walnut-sized antique ring boxes, he sculpts classical-looking scenes with powerful messages. The two sculptures above are from Talwst’s newest series, titled “Minimized Histories: Marginalization and Unrest,” which examines the treatment of First Nations women in Canada, and how those atrocities are echoed elsewhere. 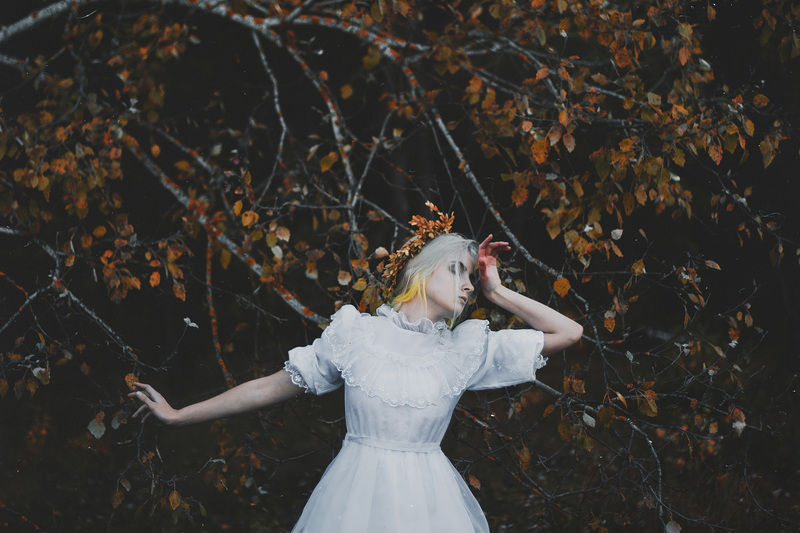 Initially, Talwst seduces the viewer with bright colors and peaceful forest scenes. 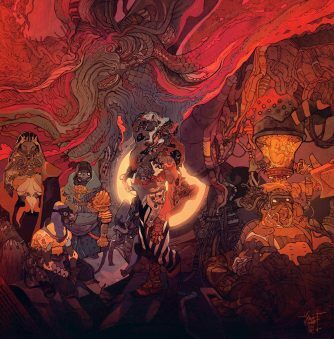 Upon closer inspection, however, the darkness and violence are revealed, lingering within the landscapes like restless ghosts, challenging the misguided belief that we live in a decolonized, post-racial world. Many of the plants in Logan’s works can be found flourishing along the roads of the Canadian prairies. Hailing from Saskatoon, a city at the heart of the Canadian prairies, Zachari Logan draws, paints, and sculpts artworks that blend the masculine, queer body into wild landscapes. Many of Logan’s works are self-portraits that seek to explore his own body and how his identity intersects with history, mythology, and the chaos of nature. 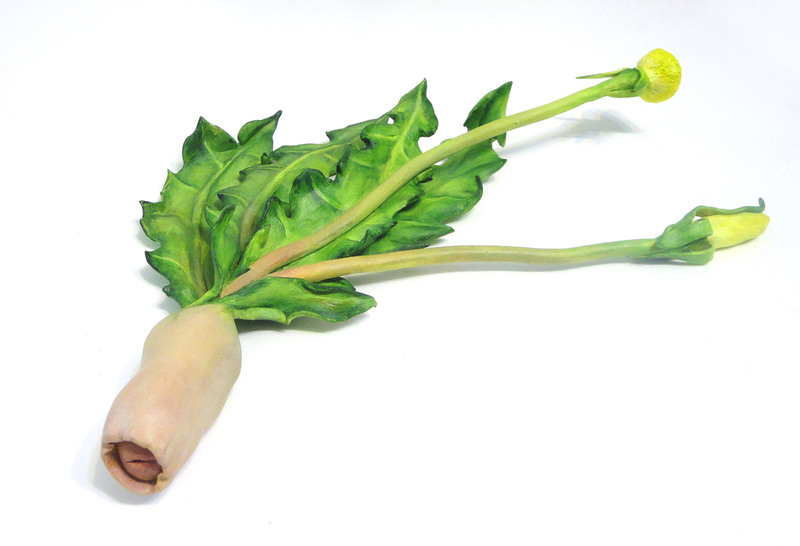 Significantly, he combines plants that are native and alien to the region. 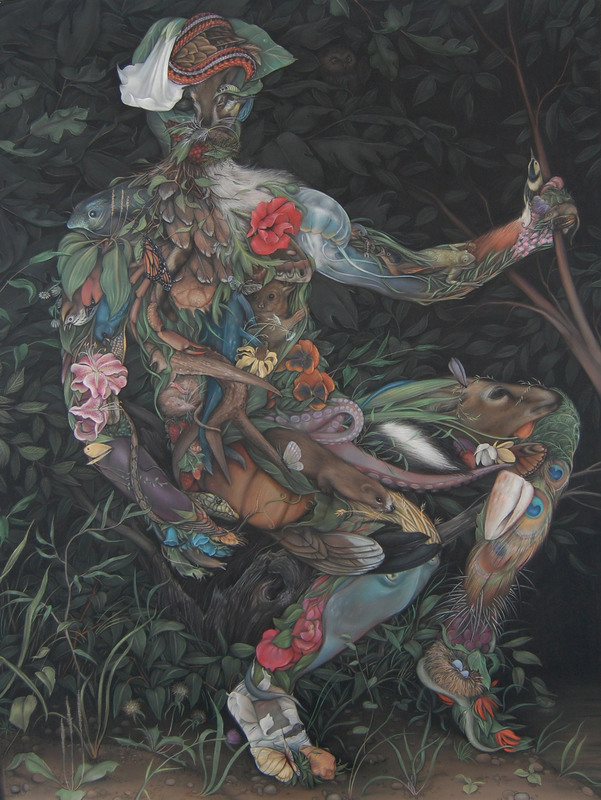 This hybridizing of different species and biomes represents a figurative state of liminality—or “in-betweenness”—which challenges the binaries of “here” and “there,” “masculine” and “feminine.” For Logan, the prairies provide fertile terrain for the exploration and expansion of identity. 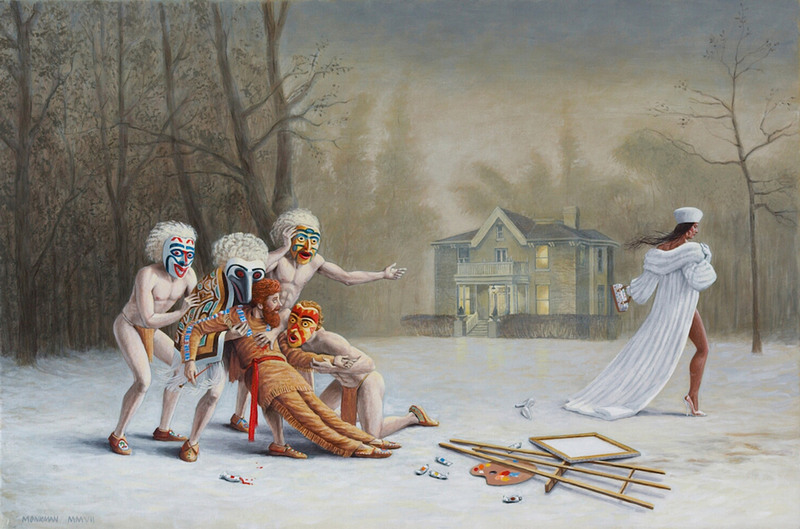 Monkman’s alter ego, Miss Chief Eagle Testickle, appears in many of his works, representing a challenge to traditional, European understandings of sexuality and gender. Kent Monkman is a queer Cree Canadian who puts a subversive spin onto colonial imagery, providing a First Nations account of the European settlement in Canada; whereas colonial paintings traditionally marginalized the presence of First Nations, Monkman aims to reclaim it. Set against the vast backdrops are not white men “civilizing” the land, but rather First Nations people in states of resistance and response. As a comment against the effect of Christianity on First Nations sexuality, Monkman’s drag queen-alter ego frequently arrives on the scene to trouble gender and sexuality binaries. 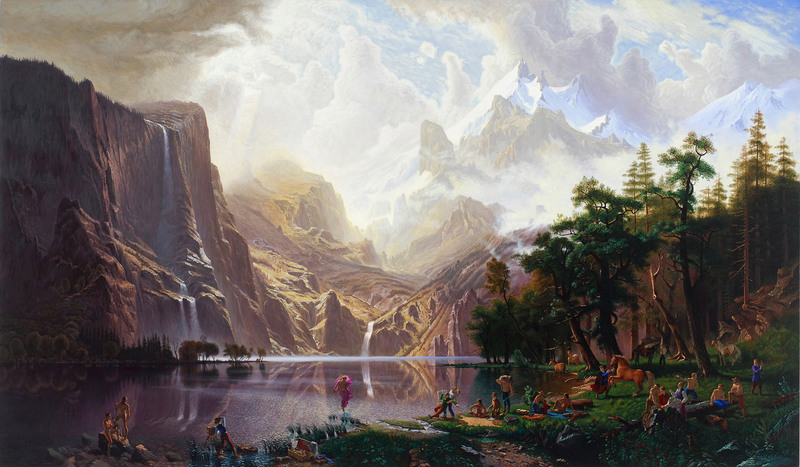 By giving settler-era North American landscapes a new meaning, Monkman shows that it is possible to have multiple histories and mythologies. 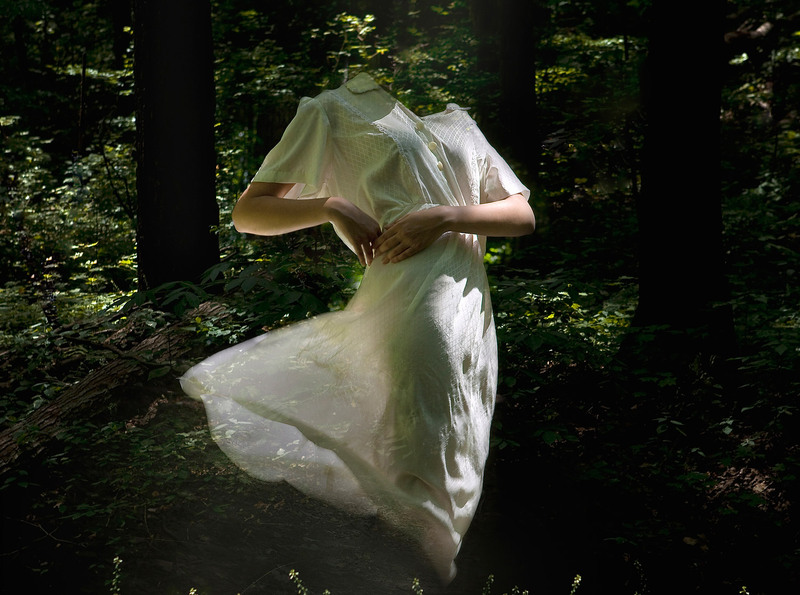 Guegan’s surreal images often resemble terrifying or beautiful dreams. 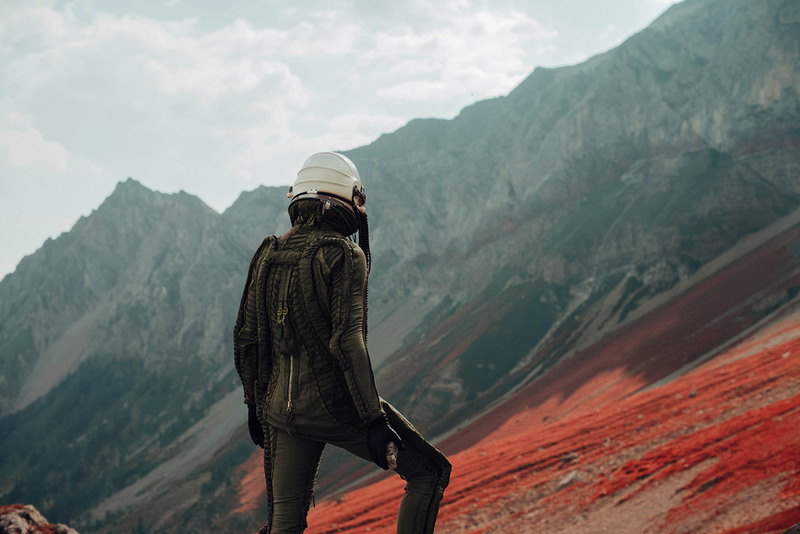 Montréal-based photographer and filmmaker Clément Guegan brings the mystery of the human mind into his unique visions of Canada. 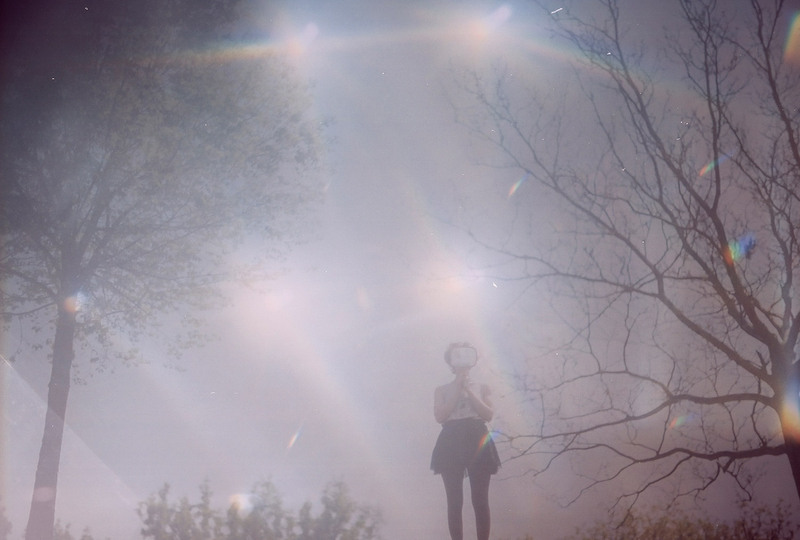 Fascinated by dreams, alienation, and the loss of identity, many of his images involve people plummeting from the sky or staring into bleak horizons. 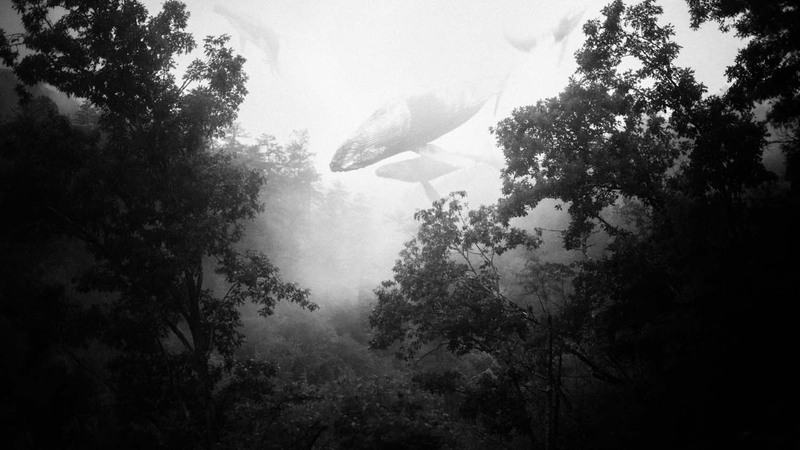 Some scenes have elements of magic, transforming misty skies into the deep sea. With no direction or firm sense of what is real, Guegan’s conceptual photos provide breathless representations of present-day life and the unknowability of the future. 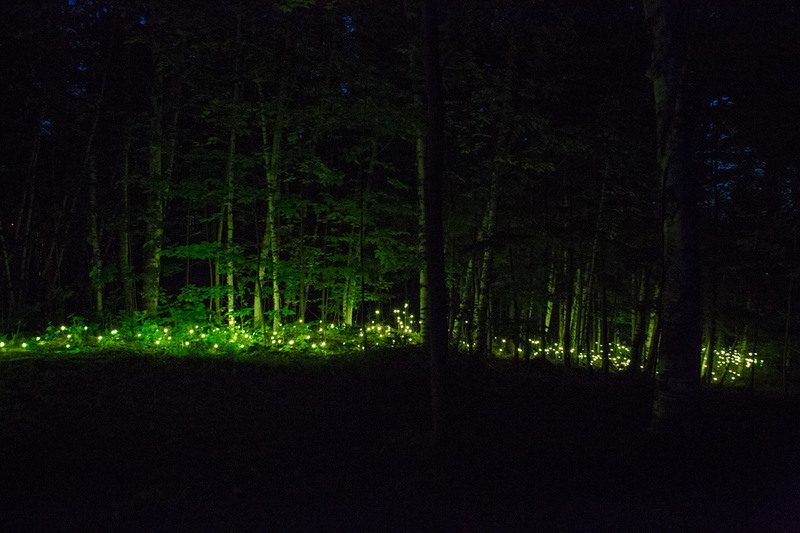 “Foresta Lumina” stretches an enchanted 2 km through a forest in Quebec every summer. Finishing off the list is this beautiful, immersive, yearly installation designed by Moment Factory, a Montréal-based multimedia entertainment studio. 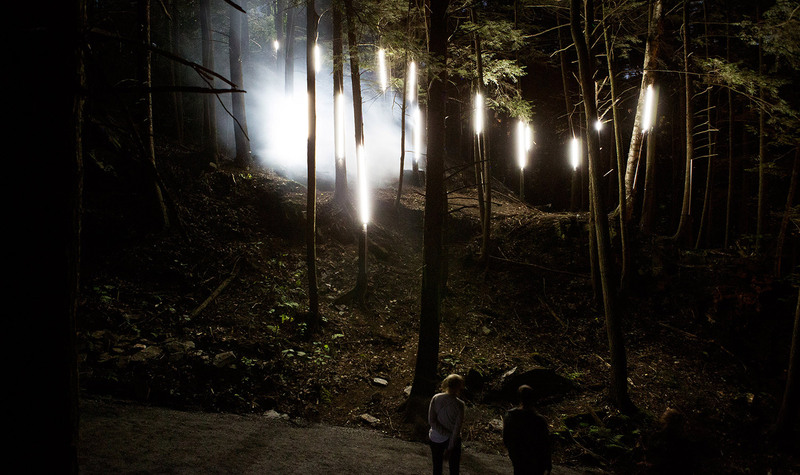 Named “Foresta Lumina,” the project transforms a trail in Parc de la Gorge de Coaticook (Quebec) into an interactive nighttime stroll through a fairytale forest using the power of video projections, unique lighting designs, and atmospheric sound effects. By corresponding art with the inherent beauty of the wilderness, Moment Factory reinvests familiar natural environments—and the mythologies that underlie them—with a renewed sense of awe and respect. 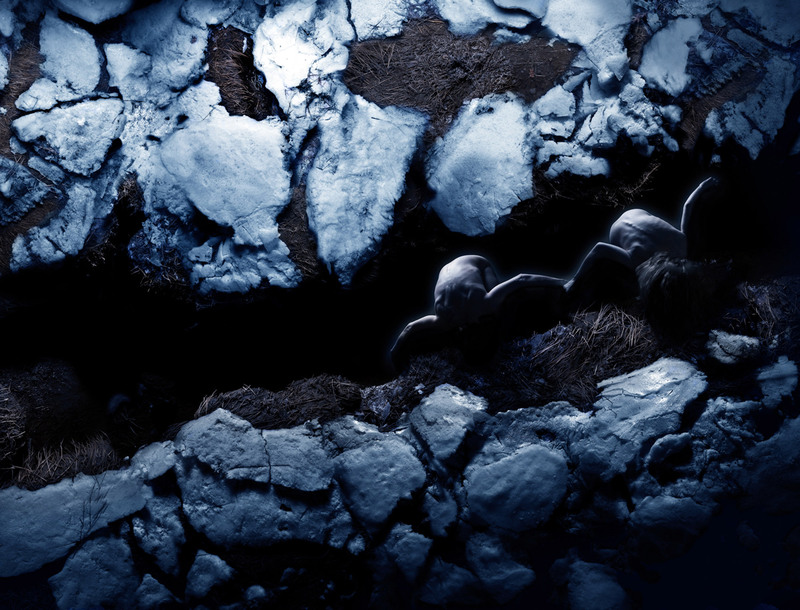 “Foresta Lumina” will be returning in 2016.